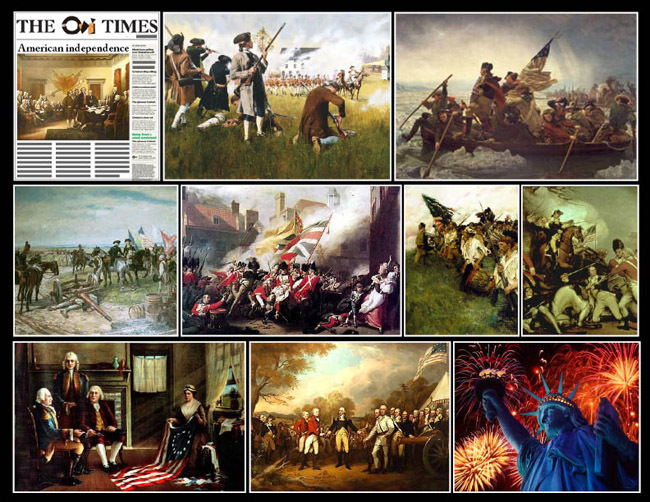 July 4, 1776; U.S. declares independence. In Philadelphia, Pennsylvania, the Continental Congress adopts the Declaration of Independence, which proclaims the independence of the United States of America from Great Britain and its king. The declaration came 442 days after the first volleys of the American Revolution were fired at Lexington and Concord in Massachusetts and marked an ideological expansion of the conflict that would eventually encourage France's intervention on behalf of the Patriots. The first major American opposition to British policy came in 1765 after Parliament passed the Stamp Act, a taxation measure to raise revenues for a standing British army in America. Under the banner of "no taxation without representation," colonists convened the Stamp Act Congress in October 1765 to vocalize their opposition to the tax. With its enactment in November, most colonists called for a boycott of British goods, and some organized attacks on the customhouses and homes of tax collectors. After months of protest in the colonies, Parliament voted to repeal the Stamp Act in March 1766. Most colonists continued to quietly accept British rule until Parliament's enactment of the Tea Act in 1773, a bill designed to save the faltering East India Company by greatly lowering its tea tax and granting it a monopoly on the American tea trade. The low tax allowed the East India Company to undercut even tea smuggled into America by Dutch traders, and many colonists viewed the act as another example of taxation tyranny. In response, militant Patriots in Massachusetts organized the "Boston Tea Party," which saw British tea valued at some 18,000 pounds dumped into Boston Harbor. Parliament, outraged by the Boston Tea Party and other blatant acts of destruction of British property, enacted the Coercive Acts, also known as the Intolerable Acts, in 1774. The Coercive Acts closed Boston to merchant shipping, established formal British military rule in Massachusetts, made British officials immune to criminal prosecution in America, and required colonists to quarter British troops. The colonists subsequently called the first Continental Congress to consider a united American resistance to the British. With the other colonies watching intently, Massachusetts led the resistance to the British, forming a shadow revolutionary government and establishing militias to resist the increasing British military presence across the colony. In April 1775, Thomas Gage, the British governor of Massachusetts, ordered British troops to march to Concord, Massachusetts, where a Patriot arsenal was known to be located. On April 19, 1775, the British regulars encountered a group of American militiamen at Lexington, and the first shots of the American Revolution were fired. Initially, both the Americans and the British saw the conflict as a kind of civil war within the British Empire: To King George III it was a colonial rebellion, and to the Americans it was a struggle for their rights as British citizens. However, Parliament remained unwilling to negotiate with the American rebels and instead purchased German mercenaries to help the British army crush the rebellion. In response to Britain's continued opposition to reform, the Continental Congress began to pass measures abolishing British authority in the colonies. In January 1776, Thomas Paine published Common Sense, an influential political pamphlet that convincingly argued for American independence and sold more than 500,000 copies in a few months. In the spring of 1776, support for independence swept the colonies, the Continental Congress called for states to form their own governments, and a five-man committee was assigned to draft a declaration. The Declaration of Independence was largely the work of Virginian Thomas Jefferson. In justifying American independence, Jefferson drew generously from the political philosophy of John Locke, an advocate of natural rights, and from the work of other English theorists. The first section features the famous lines, "We hold these truths to be self-evident, that all men are created equal, that they are endowed by their Creator with certain unalienable Rights, that among these are Life, Liberty and the pursuit of Happiness." The second part presents a long list of grievances that provided the rationale for rebellion. On July 2, 1776, the Continental Congress voted to approve a Virginia motion calling for separation from Britain. The dramatic words of this resolution were added to the closing of the Declaration of Independence. Two days later, on July 4, the declaration was formally adopted by 12 colonies after minor revision. New York approved it on July 19. On August 2, the declaration was signed. The American War for Independence would last for five more years. Yet to come were the Patriot triumphs at Saratoga, the bitter winter at Valley Forge, the intervention of the French, and the final victory at Yorktown in 1781. In 1783, with the signing of the Treaty of Paris with Britain, the United States formally became a free and independent nation. “Eternal vigilance is the price of freedom” warned Thomas Jefferson. Even more ominously John Adams informs us that “There never was a democracy yet that did not commit suicide.” Those two founding fathers of modern democracy had grasped the paradox that the return to tyranny, when and if it comes, will have been accomplished “democratically” by voting for it and by selecting the likes of Donald Trump. The warning is valid on both sides of the Atlantic by the way...After all, on both sides we are today celebrating some kind of exit from some kind of dependency…oblivious of the fact that a door can be open and closed from the inside as well as from the outside and that genuine freedom is always accompanied by responsibility.